Bus stops are pretty much every where in the UK. Clear Channel, the outdoor UK advertising signs provider, innovated back in 2012 by rolling out over 10,000 NFC/ QR Code enabled digital advertising boards at bus stops around the country. If you are scouting around to find innovative companies in the retail sector, then the small chains in the streets around Oxford Street, London are a preverbal treasure trove of ideas. 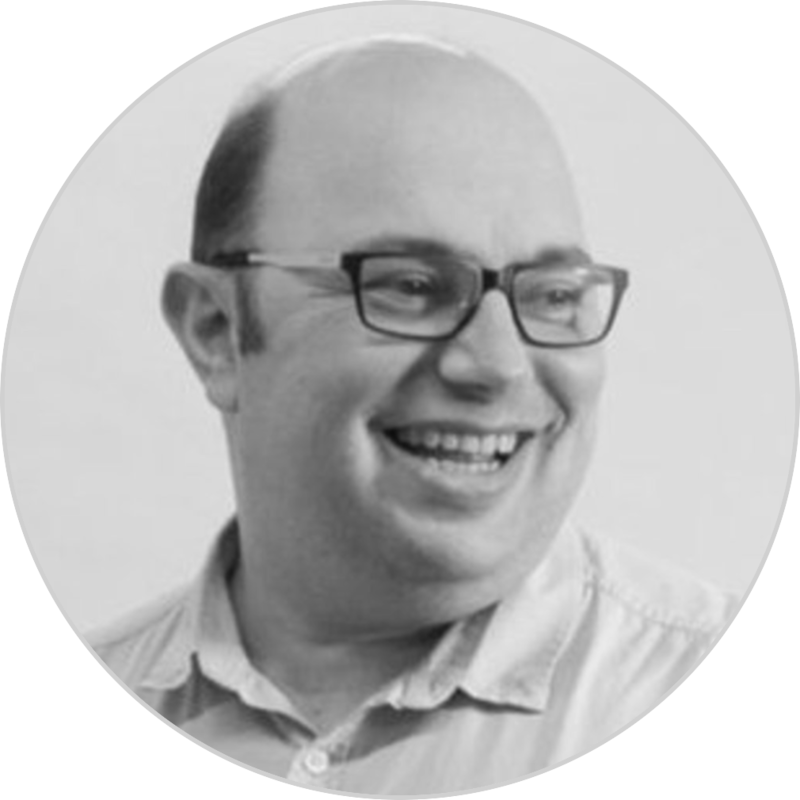 These shops have the combined ambition to be the next super chain, coupled with the cashflow and cost focus of a small business. They can’t invest in tech, unless if helps the bottom line or generates an interest. 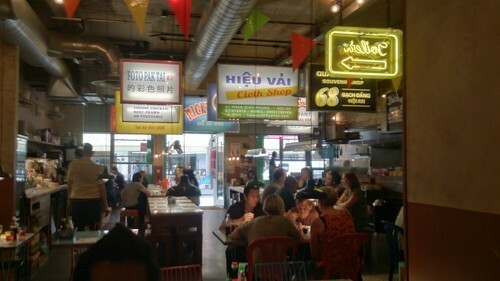 East Street Restaurant is one of the bevy of new restaurants that offer East Asian Street Food. With only 5 or 6 stores in the group, this chain is big enough to be doing some digital elements. At the end of an amazing meal, they hand out a feedback form, with a qr code on it. 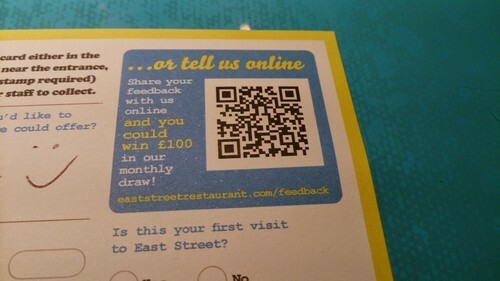 They offer users a chance to win £100 in exchange for feedback. I am not sure it does. I didn’t use it. Mainly because when I scanned the qr code, I was presented with a non- mobile webpage. If they made the feedback form work nicely on mobile, I am sure they would get a much higher response rate and more juicy feedback from visitors to the restaurant. Online web form integrated into a desktop website. On the weekend, I popped down to Westminster lodge for a swim, and I was chuffed to see that Everyone Active ( the Health Club management company) had put in digital Kiosks to collect feedback from visitors. All-Saints, the British Fashion Retailer, is one of the current companies looking to push the envelope of using digital in fashion. Their CEO, William Kim, was recruited from digital stalwart, Burberry. In Feb 2013, Kim did a fascinating interview with the telegraph where he talked about his digital vision for All-Saints. 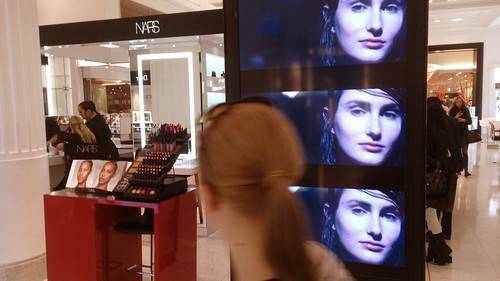 When it comes to in-store technologies the current vanguard is the use of in-store lcds. One of my favourite usages is Selfridges Beauty counters. 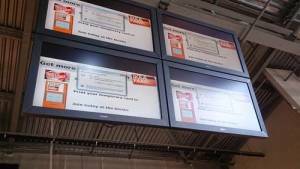 Its a natural evolution of the static image based point of sale. Replacing a static image of a model with a moving image of a model shot beautifully. Cheap to integrate – by building in a standard television lcd into the stand, you can incorporate enhanced content. Non- intrusive to the customer purchase experience. 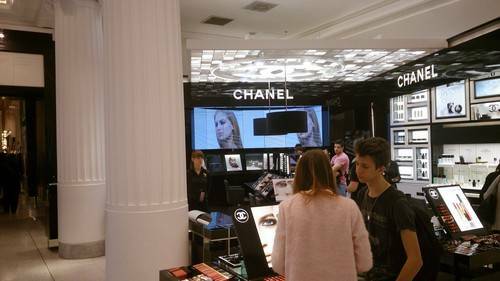 Chanel’s main beauty counter has a beautiful video lcd panel as the focus of their stand. 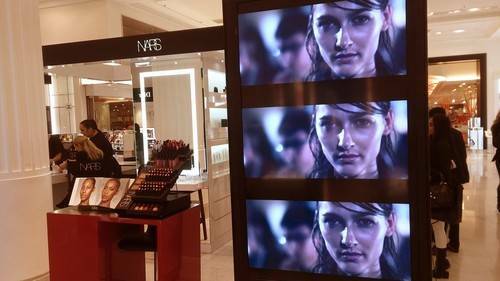 Nars liked the video lcd so much, they used 3 of them to welcome customers onto their stand.